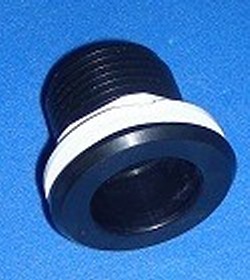 NEW, 1" BLACK bulkhead fitting (aka tank adapter) fitting. Front and back are 1" slip socket (Fits sch 40/80, etc pipe. 1.31" ID on the socket) Wall thickness up to 1-1/8". Hole saw size is 1-5/8". Front flange diameter is 2-1/4". Lite duty fitting. No gasket. You can buy extra gaskets here.